I was a new parent, having lunch with a lesbian activist, when she told me the best-kept secret of hipster parenting in Santa Cruz: the Elks Lodge. I knew the Elks Lodge as the weird building on the hill with an overabundance of wood paneling. The Elks, or the Benevolent and Protective Order of Elks as they are officially called, are a fraternal society of do-gooders founded in 1868. For over one hundred years, they accepted white men only. It took until the mid-1990s for women and people of color to be eligible for membership, and even then, most Elks Lodges stayed white, male, and aging. But funny things were afoot at Lodge 824 in Santa Cruz. By 2015, the Elks Lodge had become a haven for LGBT parents of young children. I didn’t get it. I thought of the Elks Lodge community as a bunch of elderly guys at the bar. Then my friend explained: it was all about the pool. The only public pool in the city of Santa Cruz was closed in the 2008 recession for four years. During that dry spell, a few enterprising families sought another place to take a dip. They noted that the Elks Lodge had a great pool, plus cheap drinks and a barbecue. So a few of them got sponsored by existing members, swore to believe in God and fight Communism, and they were in. Over time, they became a dominant force at the Lodge, taking on leadership positions and advocating for more active community involvement. They had trouble getting all the way in the room; elder Elks stuck to traditions like weekly board meetings during the workday that made it hard for newcomers to fully participate. But still, what was once a bar for old men expanded to become a community center for young families, led by a group of lesbians who only twenty years ago would have been shunned and excluded by the Elks. You can read this story at least two ways. Is it a story about an old room made relevant for new reasons? Or is it a story about change and cooptation of someone’s sacred space? In any situation where you are trying to make something relevant, what you are really trying to do is make it relevant to new people or more people. Unless it’s a brand new endeavor, you aren’t starting at zero. It’s already relevant to somebody. There were already Elks. There were already opera lovers. There were already insiders. When you are on the inside, this doesn’t sound like inclusive language. It sounds threatening. It sounds like the thing that you hold dear being adulterated for public consumption. Insiders often know the totality of an entity (or have constructed their own version of it). They have a clear story about what the entity is—and isn’t. And so reaching out to someone new doesn’t look additive. It looks like a shift away from what was. A dilution of services, a distortion of values. That shift means loss, not gain. Outsiders have a different view. They can’t see the change the way insiders do. 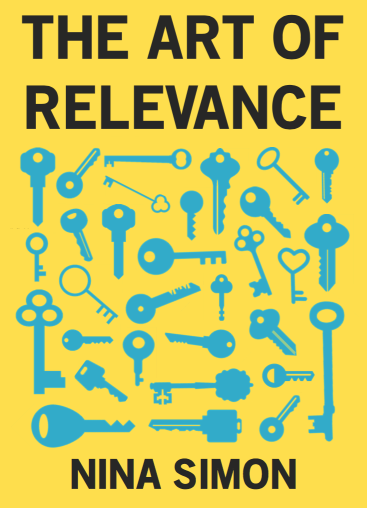 For them, relevance is a brand new door, an outstretched hand. It’s OK if at first only one part of an entity is relevant to someone new. The exhibition that speaks to their interests. The paved walking path around Old Faithful. The pool at the Elks Lodge. The entity wasn’t relevant at all previously, so if even a slice of its offerings are now relevant, the outsider has gained something worthwhile. Outsiders don’t want the room rearranged in their own image. But they do want to see reflections, expansions, and distortions of their experiences in ways that allow them to form new connections. Anytime you look at an organization and think: “They’ve gone too far. They ought not to do that,” it’s worth asking yourself why. It’s rare that an entity adds something to their programming that is so divergent, and so powerful, that it injures other aspects of the institution. It may injure your idea of that institution, but it’s worth asking whether it really injures the entity itself. Is the room still intact? Is there still a place for you in it? That’s what matters. To be relevant, we need to cultivate open-hearted insiders. Insiders who are thrilled to welcome in new people. Who are delighted by new experiences. The greatest gift that insiders can give outsiders is to help them build new doors. To say, I want you here—not on my terms, but on yours. I’m excited you think there might be something of value in this room. Let me help you access it.